At the end of a small road on the edge of the Caribbean Sea, sits Villa Tikal. Although named for a place of profound beauty and mysticism in Guatemala, this luxurious villa captures the essence of another tropical paradise with Jamaican hospitality at its heart. Step through the door into the airy, well-lit ground floor and you are immediately drawn to the view from its large windows, all of which open wide to let in the Jamaican sunlight and cool tropical breezes that cause the tall palm trees and lush surrounding foliage to sway gently throughout the days and nights. Your eyes will gaze out to the wide welcoming patio and its lush views of beautifully landscaped gardens, on to the nearby pool and out to the sea beyond. A three bedroom villa, Tikal captures the essences of India and Bali with wide couches that invite you to lounge and indulge in conversation or share comfortable, quiet moments with touches of ‘zen’ dotted throughout, from stone garden lanterns to corners built for meditation. The villa invites you to pick a spot and chill, whether its downstairs in the living room, sitting together on the patio or upstairs where a wide lounging area offers another favourite setting to sit and read or simply watch the sun go down (or come up!). Double doors, framed in the same rich wood reflected throughout the villa, create walls that literally open out to the sea, while thick nautical ropes create a natural protective railing and a feeling that the lounge now extends to the view beyond. Both bedrooms upstairs open off of this spot, with the master bedroom sharing similar large glass folding doors, allowing guests to wake up to the stunning view shared from the upstairs lounge, while curtains can be drawn across to provide intimacy and privacy if preferred. The ensuite bathroom reflects the natural elements and compliments the high wooden ceilings and natural fibers found throughout Villa Tikal. The second bedroom upstairs offers tiered sleeping accommodation with a large bed for a second couple and an upper bunk if it’s simply a fun getaway for friends or if you brought the kids along for the holiday. The bed also boasts ample storage space for all the swimsuits you brought along or just a temporary home for all the souvenirs you plan to take back home. Here too you will find a full en suite bathroom while the bedroom downstairs comfortably accommodates a couple with a full bathroom on the same level. A modern touch is present throughout the house with features such as air conditioning in every room to complement powerful overhead fans, stainless steel appliances in a bright kitchen accented with colourful tile work, a cold and hot drinking water dispenser, and more than one way of making coffee exactly how you like it. And that’s where Marcia comes in. The villa’s housekeeper for the past thirty years, Marcia has played host to film crews, movie stars, diplomats, families, celebrating friends and couples on romantic getaways. Her food is mouthwatering, whether it’s Jamaican staples like fricassee chicken and rice and peas, curried chicken or shrimp, a nice cold pasta salad, a savoury breakfast of pancakes and bacon or just a hot cup of coffee at the right time. Upon your arrival, you’ll be greeted with the villa’s cool signature welcome cocktail (with or sans alcohol, as you prefer). Marcia will then show you where everything is, how it all works and, if you’re in the mood to explore beyond the villa, she’ll suggest excursions and help organize how to get you there. A handy guide book is always there for reference in case you need a number or a little time to make your choice. 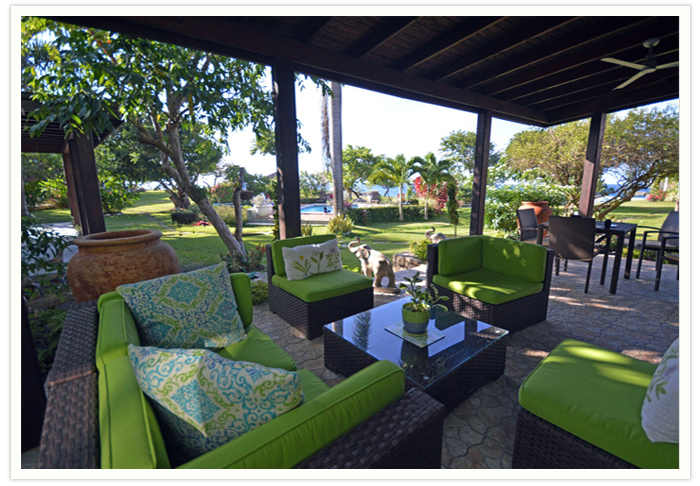 Located just 20 minutes from the bustling north coast town of Ocho Rios and on the direct route from the Montego Bay airport, Villa Tikal is in the perfect spot to get away and relax, yet close enough for you to maximize your vacation time. When you choose to stay at Villa Tikal, arrangements can be made for airport transfers, Meet and Greet VIP Fast Track and Arrivals Lounge services, as well as access to both VIP lounges, Club Mobay and Club Kingston. Other transportation can also be arranged for you to enjoy all the leisure attractions nearby, including one of Jamaica’s premiere attractions right next door, Chukka Adventures with a 20% discount for all Villa Tikal guests. 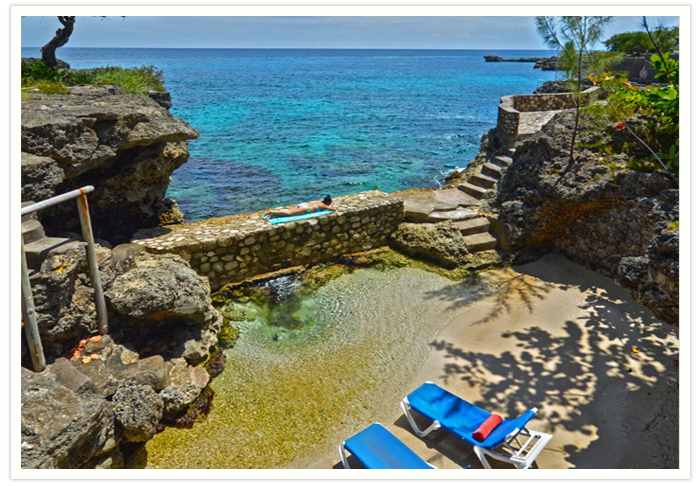 In just 15 minutes you can be at Dunn’s River Falls to make the world famous climb, swim with dolphins or sharks, go on a nature trail at Dolphin Cove or fly through the trees on the bobsled track or the ziplines at Mystic Mountain. 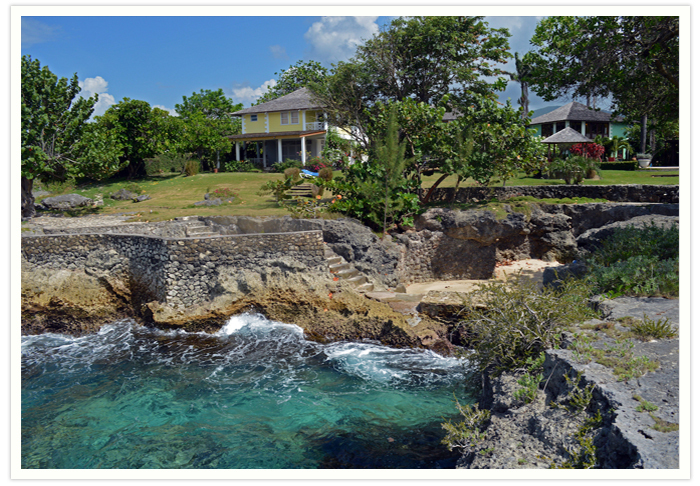 A few more minutes away and you’ll be in the heart of Ocho Rios, one of the most visited towns in Caribbean history. The town has every amenity you may need, from supermarkets to pharmacies and some great restaurants, including the well-known Margaritaville and Evita’s on the hill with a view looking over the bay. If you want to stay closer to your new home away from home however, there are restaurants nearby and a convenience store just across selling items Marcia can use to wow your palate. 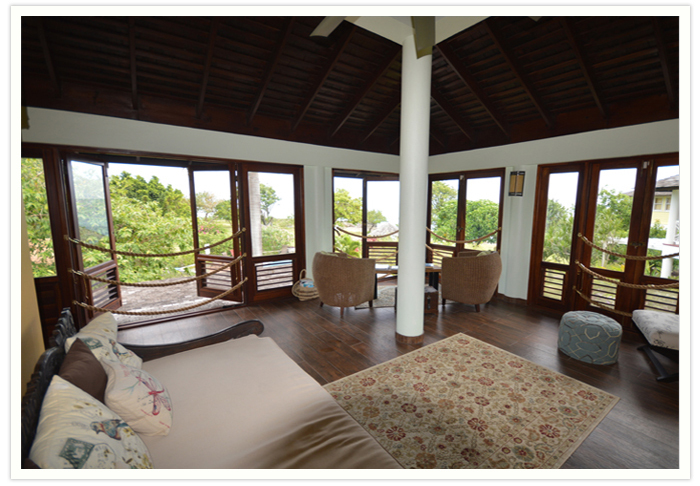 Several other small villas sit beside Villa Tikal, each its own private paradise. A great option for a large group of friends or several families, the setting is the perfect balance of private moments and shared memories. 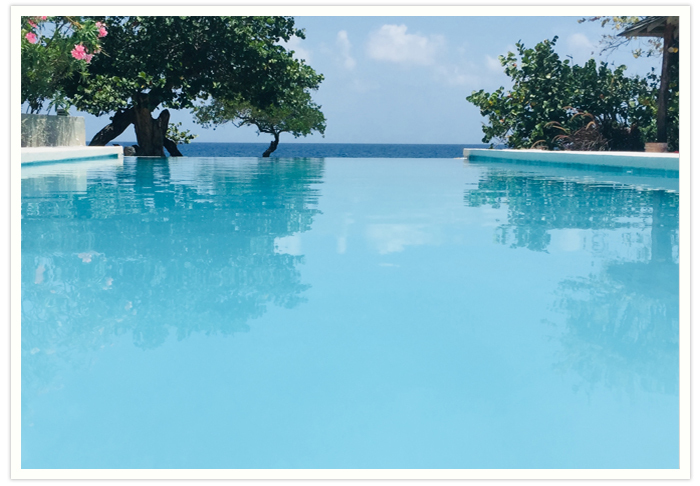 A large stretch of lawn hugs the cliffside while the pool provides a wonderful spot to gather with a view of the sea by day and of the open starry sky at night. After a day tanning on the sand, playing in the stunning shifting blues of the Caribbean Sea or just lazing and laughing by the pool, or in the natural crystal clear grotto, retiring to the villa is the perfect way to end a day in paradise. Curl up with your favourite book in one of the many snug corners or stretch out on one of the wide couches for good conversation and an evening enjoying the state of the art entertainment system. Maybe you’ll want to watch one of the many movies provided on DVD or switch on the Apple TV and shift into ‘Netflix and Chill’ mode. For others simply kicking back and listening to music on the amazing surround sound system is the best way to close out an already relaxing day. For those still feeling a little more social, the villa’s bar area provides the perfect gathering spot to recount the adventures of the day and make your plans for tomorrow. The best part is when you sink into your plush bed after a day and night of making memories, you’ll fall asleep knowing that tomorrow, you get to wake up in paradise and do it all over again. *For Groups of 5 or more staying 8 Days or longer.